Intertek biomass fuel testing laboratories test biomass fuels for quality. Crucial biomass fuel tests include calorific value, ash content, moisture content, sulphur content, pH, chloride content and other tests. Biomass fuels tested for quality include wood products, crops, other plants, manure, some types of rubbish and other organic materials which can burn. Biomass fuels are derived from renewable sources, such as wood chips, waste materials, and plants. 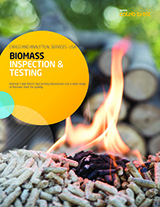 Biomass fuel test methods include the ASTM E870 standard, including proximate analysis, ultimate analysis, and the gross caloric value of wood fuels.